When one thinks of Thomas Jefferson perhaps Mount Vernon or Mount Rushmore may come to mind. However in 1895, Major Lewis Ginter felt his hero deserved more recognition so he built the Jefferson Hotel in Richmond, Virginia. His goal was to make this the finest hotel in America. Now, nearly 115 years later it is hard to argue with his vision. If you have the good fortune to spend some time in Richmond, Virginia, there is no finer place to stay than the Jefferson Hotel. It has received a well deserved Mobil Five Star and AAA Five Diamond rating. 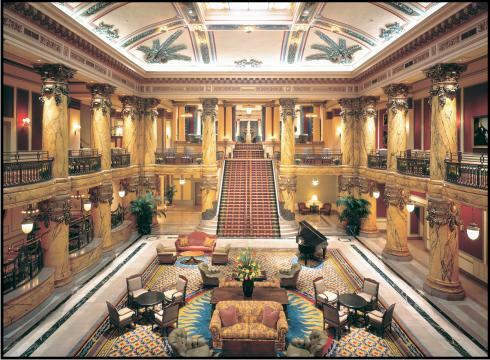 The luxurious Palm Court lobby leads to a breathtaking rotunda with a 70 foot ceiling, massive faux marble columns and a grand staircase. Even if you do not stay at the Jefferson it should be visited. Partaking of high tea or its award winning Sunday Brunch would be a memorable experience. The Jefferson has two town cars and a fifteen passenger van which provide complimentary transportation for guests to museums, and shopping destinations within a three mile radius of the hotel. There are 262 luxurious guest rooms and suites with flat screen TV, marble bathroom, work desk, high speed internet access plus a fitness center and indoor pool. The Jefferson Hotel is currently offering a “Shoestring Package” available from June 3rd until September 7th 2009. The rate for a superior room is only $205 [reg. $365] and $225 [reg. $395] for a deluxe room. A Southern breakfast for two, $25.00 gift card and valet parking are all included. 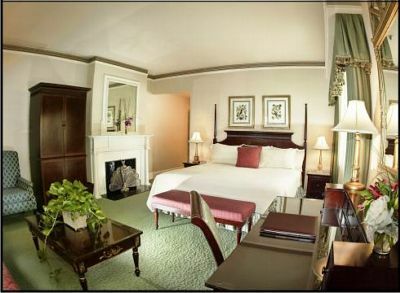 For more details and other packages go to www.jeffersonhotel.com or call 1-800-424-8014. Famous guests who have stayed at this magnificent hotel include Presidents Taft, Roosevelt [both], Wilson, the Bushes plus F. Scott Fitzgerald, Bernard Shaw, Sinatra, Rolling Stones, Seinfeld, Gorbachev, General Schwartzkopf and so many more. Why not join this illustrious list … the prices have never been better! Major Ginter has several other claims to fame. He made a fortune in tobacco and was responsible for producing the earliest baseball cards [distributed in cigarette packs] as well as non sports cards in the 1880’s. 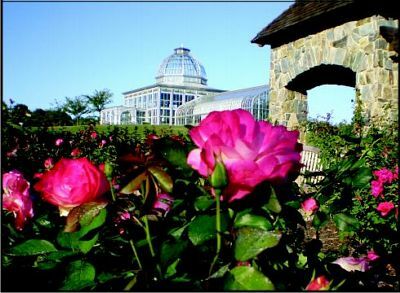 He also gave Richmond the Lewis Ginter Botanical Gardens, a must see for all visitors. When we visited the gardens there was an antique car show in the parking area which was an unexpected bonus. Featured was over 1800 roses in the Rose Garden, a Healing Garden where medicinal properties of plants are studied, the Asian Valley, Palm House Conservatory, Interactive Children’s Garden, Perennial Garden, Wetlands, Victorian restorations, gazebos, lakeside flowers and a wonderful Tea House and Garden Caf?. For a schedule of events go to LewisGinter.org. There are many museums and historic homes including the Edgar Allen Poe Museum, the Virginia Holocaust Museum [Va-Holocaust.com], several plantations, art galleries and even Richmond’s Hebrew Cemetery for Jewish Confederates who fought and died in Virginia. Shopping in Carytown, a huge pedestrian only area that has fashionable boutiques, and an array of interesting stores and restaurants is recommended. Can-Can Brasserie is a good choice for lunch or dinner. Other favorites of ours include Ipanema Caf? featuring mostly vegetarian entrees with nightly fish specials [917 W Grace Street 213-0190]. There is also Kuba Kuba which is a good value for Cuban cuisine [1611 Park Avenue 355-8817]. Of special interest is the Byrd Theatre, an old fashioned movie theater which shows recent films for only $2.00 per person which can be logged in at www.byrdthertre.com. Grant might have once taken Richmond but one should never take Richmond for granted.